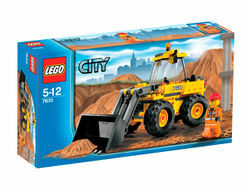 7630 Front-End Loader is a City Construction set released in early 2009. It contains a loader and one Construction Worker minifigure. This set was included in the Product Collections set 2853302 City Construction Collection. This is a description taken from LEGO.com. Please do not modify it. (visit this item's product page) Rough, tough construction machine! Clearing out a construction site is easy for this rugged front-end loader. With its big excavator bucket and heavy-duty wheels, it can load up a dump truck and get back to work in no time! Move around the construction site with ease! Front end loader pivots and the bucket lifts and lowers! Includes 1 construction worker minifigure! Facts about "7630 Front-End Loader"
This page was last edited on 9 February 2019, at 22:37.